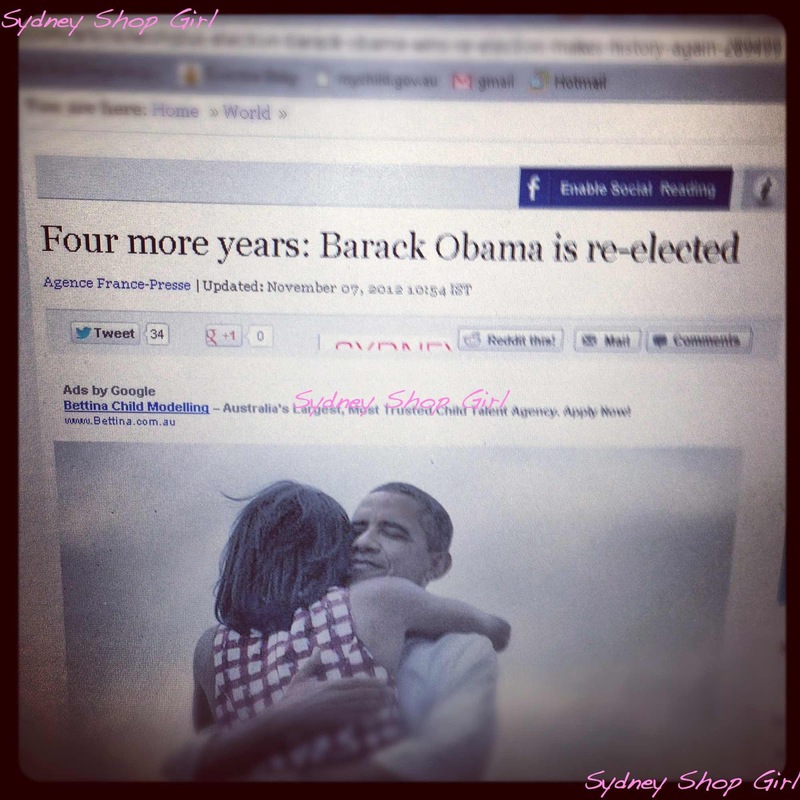 Sydney Shop Girl: Barack, Baby and Books. The people have spoken in the USA and they have picked the right man to lead them as President. Half a world and several timezones away, I was glued to my radio and the online papers as the results trickled through yesterday. I was without both when the final result was announced but twitter soon had me back in the loop when I did resurface from my media vacuum. I drove home last night listening to President Obama's victory speech and was in awe from his opening sentence. It was a speech that still had the fire and passion of 2008 but the images and thoughts were tempered by 4 years worth of experience leading his country through troubled and conflicted times. It was also a speech that encompassed his love and admiration for his family as well as offering reassurance to Americans that they had been heard and that their concerns were being addressed. No sector of the diverse American population was left unacknowledged. The Australian papers this morning are already discussing the fact that President Obama has 54 days to rescue the country from falling off a fiscal cliff if he cannot get Democrats and Republicans to agree on a financial plan. I hope that his words of admiration for Governor Romney and his invitation that they work together for the future of all Americans were not just rhetoric. The four more years embrace.... Michelle really, really loves that ASOS dress we share! Photo from Ben & Jerry's Australia's Facebook page. 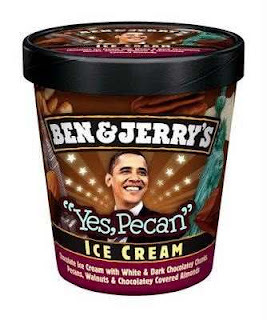 And this new release from Ben and Jerry's. Since I now have more downtime than up and about time, I've been spending a lot of time in the company of my Kindle. With varying degrees of satisfaction. 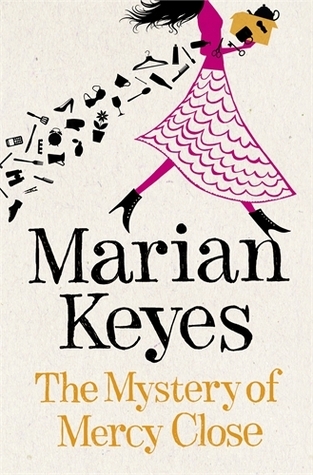 'The Mystery of Mercy Close' is Marian Keyes' latest novel and features the likeable Walsh family from previous Keyes novels. The plot centres around Helen Walsh who is a private investigator and also had to battle depression and the frustrations of not always responding well to treatment. Helen's task in this novel is find the missing member of a boy band and in the process she finds herself getting tangled up with an ex-boyfriend and relapses of her depression. I really wanted to enjoy this novel. Keyes is an entertaining writer and she usually attacks chick lit with intelligence and warmth. I also appreciated the sensitivity with which she portrayed Helen's depression and its treatment. However, the whole novel was just so long and drawn out. I found it difficult to empathize with Helen let alone stir up enough energy to care about the mystery surrounding ageing boy band member Wayne's sudden disappearance. I finished the book out a sense of duty which is a sad thing to say about the work of one of my favourite authors. On the other hand, a Kindle novel recommended to me by twitter proved to be a surprise hit. 'On the Island' by Tracy Garvis Graves was everything that chick lit should be. It managed to take its readers into a daydream world whilst grounding the fantasy with just enough of the real world to satisfy an older woman's need for a bit of commonsense and logic, even in their recreational reading. The novel begins with 16 year old TJ and his thirtysomething tutor Anna preparing to take a flight to the Maldives to join the rest of TJ's family. TJ as just gone into remission from lymphoma and due to the rigours of his treatment, had missed a great deal of school. Anna was hired for the summer to help him get up to speed with all that he had missed. Anna herself had some major upheaval in her life prior to this assignment. She'd just ended a long term relationship with a man who seemed unable to give her the commitment she needed from him. The promise of a summer getaway in the tropics soon turns into a nightmare when the pilot on the TJ and Anna's chartered flight suffers a heart attack mid flight and dies, crashing the small plane in the process. TJ and Anna are the only survivors and despite their injuries, they managed to swim to the shore of a tropical island uninhabited by humans. Thirsty and near death, they managed to survive as their belongings gradually drift to shore. As more of their possessions appear, the pair begin to adjust to their new life on the island and a deep friendship develops. I was told that this was a reboot of 'The Blue Lagoon' and I kept this thought at the back of my mind as I read the rather sedate opening chapters of the novel. Years pass on the island and the predictable happens between a now 19 year old young man and a much older woman who still has youth and her own yearnings. After four years together on the island, TJ and Anna are rescued. They have changed and so has the world they left behind. Both their families conducted funerals for them, assuming they had died and tragically, both of Anna's parents died as well. TJ and Anna become media fodder and the romantic nature of their relationship is revealed. The second half of 'On the Island' explores the couple's life away from their tropical prison. Not only do they have to adjust to their return to civilization but they also now have the added pressure on their relationship of the scrutiny of friends, family and strangers. Garvis Greaves develops all of these themes with a knowing and observant eye and I enjoyed this second half of the novel even more than the first. 'On the Island' was a very enjoyable read, perfect for the Christmas / New Year break. I'm nearly there, one more day at work tomorrow and then the real fun begins! I love marian keyes, might have to get the book for reading on my ipod! We're celebrating the election results over here! 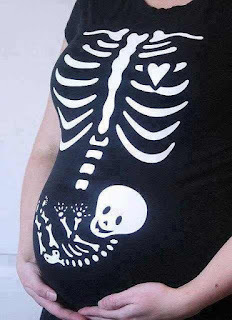 Great tee-shirt - not long to go now till the little one arrives by the looks of it! When are you due? Asian babies are the CUTEST BABIES IN THE WORLD! I heaved a sigh of relief when it was announced. I wasn't quite sure to be honest. Have googled and ordered the t-shirt. Love. I had low expectations for "On The Island." Bought it on iBooks quickly as they called a flight I was on. Loved it though. Way better than it looked like it was going to be. I enjoyed Mercy Close as well though. Not long now for Baby SSG to make his long awaited appearance. Excitement!!! I love your book reviews, I'm building my summer reading list now. Enjoy your last day. The next year is going to fly by! I agree re Mercy Close - I thought it was awful!